Sidney N. LeCeur, 25, of Oswego, passed away suddenly Saturday morning May 27, 2017. 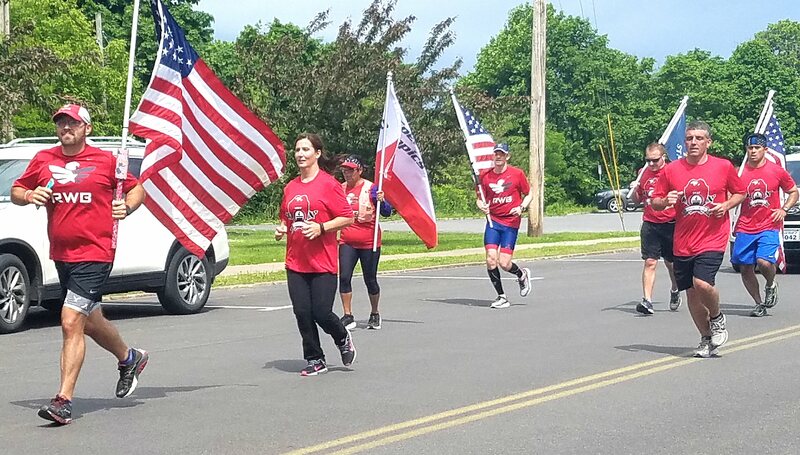 Members of local law enforcement carried the “Flame of Hope” 12 miles from the Oswego Police Department to the Fulton Police Department on Wednesday in the annual Law Enforcement Torch Run for Special Olympics New York. Oswego Police Department, Fulton Police Department, Oswego County Sheriff’s Department and New York State Police participated. They were joined by members of Team Red, White and Blue. Beverly J. James, 68, formerly of Sterling, passed away Tuesday May 30, 2017, at St. Luke’s Health Services in Oswego. The methanol-breathing, winged warriors of the Patriot Sprint Tour and the 800-horsepower Tracey Road Equipment Big Block Modifieds will put on a night of high speed, wheel to wheel racing this Saturday, June 3, at the Fulton Speedway on Penn Power Group night. Breezy with showers and storms popping up, possibly with heavy downpours and gusty winds today. High in the lower 70s. Today’s News: Hoops for Hope Donation; Senior Trip Was Busy and Exciting; National Technical Honor Society Induction; and more in today’s edition of The Raider – written by students in the GR Bodley Journalism Club and Journalism class. There will be a benefit for Brian Kocher on July 9 from noon – 4 p.m. On Easter Sunday, he suffered a traumatic head injury from a fall that sent him to Upstate Medical. He is now doing rehabilitation. Members of Concinnity believe that “In our changing climate, politically and otherwise, it is important for everyone to stand up for peace, justice and love.” They have chosen to make their voices heard by means of a concert entitled Visions of Hope. The program will consist of songs about our environment, social justice, equality, peace, and love, and will be held at the First United Methodist Church on June 11 at 3 p.m.
World No Tobacco Day is a global effort to reduce the negative impact of tobacco in our communities. The adverse effects of tobacco use are evident in our community from tobacco-related illnesses to tobacco litter among where our children play. Not only smokers are affected by tobacco; according to the CDC, research has shown that 41,000 Americans die yearly due to secondhand smoke. On a beautiful Sunday, May 28, members of Jacksonville Faith Community guests and members of Masonic War Vet Post No. 43 led by Rev. George A. Reed gathered at Jacksonville Cemetery in the town of Lysander to honor veterans of Americas wars. The cemetery contains the remains of veterans from the American Revolution, Civil War and all conflicts.